As They Say In Syria, Shukran! This blogging stuff has continued to be quite remarkable as of late, especially the past six weeks or so. Things are happening that I simply never expected and I’m communicating with so many incredible people that it’s almost overwhelming 🙂 Basically, I couldn’t be happier with my decision to start this blog so many months ago. Also, as you might be aware, I try not to hide the fact that I am ever so thankful to everyone – readers, commenters, those who send me emails, other bloggers, twitterers, facebookers and people I meet every single day – all of whom are the people ultimately responsible for breathing life into this blog. So…as always, let me start off with another heart-felt thank you to each and every one of you! I also wanted to do a short recap of where WanderingEarl.com has been mentioned during the past couple of months and, to be honest, as I look at the list, I still can’t believe all of the support that this site has been receiving. My post “The Day US Customs Found a Bullet in My Pocket” ended up bringing more traffic to this site than ever before, which even caused my site to crash a few times. Of course, many of those visitors came and went, but for those of you who have decided to become a part of the community, I welcome you and thank you for sticking around! I was also fortunate enough to be interviewed by the wonderfully uplifting Jen Smith from ReachOurDreams.com, the always informative Natalie over at TurkishTravelBlog.com (who I hopefully will meet up with at some point during my stay in this region of the world) & the highly-motivated Jodi Sagorin from IfYouNeverDid.com, who included my interview in her impressive (and free) eBook titled “How To Be An Adventurer”. And I’d like to give a shout out to Troy from FoggOdyssey.com who wrote an excellent review of my “How To Work On A Cruise Ship” eGuide over at GoBackpacking.com. All I can say is WOW! I’d be lying if I said it didn’t feel good to see this blog appear alongside many of my very own favorite travel blogs from out there in the blogging world. I’d also like to take a quick moment to mention that it’s been quite a challenge trying to travel, work and blog all at the same time during my current trip through the Middle East. As a result, I simply haven’t been able to read as many of your own blogs as often as I’d like, to join in your discussions or to be more active in the world of social media. Please know that this is not permanent and I truly appreciate your understanding that life on the road requires a few adjustments! ONE FINAL SHUKRAN (THANK YOU)! To anyone who’s ever read a post here, subscribed to this site, joined the conversation, sent me an email, retweeted anything, mentioned a post on Facebook or on their own blog or website, please know that without you, this site simply wouldn’t exist. And that is a fact I shall never forget. That’s interesting! Shukriya in Hindi means thank you as well and yet India and Syria are so far apart! I love the camel picture. As far as I’m concerned, this is the best travel blog on the web without question. All well deserved, Earl! Rock on. It’s well deserved, you are a wonderful writer. Hey Earl, very noble post. Needed every now and again. We are nothing without our readers. Thank you for writing this great blog. In my opinion, you are the best travel blog out there right now. Many people are linking to you for a reason. Merci, merci Dereck, i’ve suscribed to your RSS feed, they are very well done, and it looks great in Pulse on iPad ! 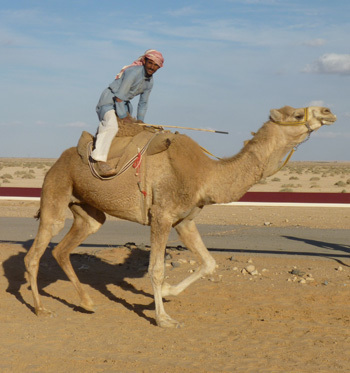 I still travel like that even at work … Isn’it a photo from the camel race in Palmyra ? I would give a lot to make another walk through the desert, it was awesome ! I’m waiting for your new site, take care ! Looks like things are going great ofr you. Congratulations, it takes a lot of hard work and dedication. I enjoy reading your blog a lot especially because you are in the Middle East an area I will be exploring on my RTW trip. Glad to be on the journey with you Earl! I love what you’re sharing with everyone here. The work you’re doing is truly inspiring! Hi Earl, I just noticed this today! Thanks for the shout out. 🙂 I love the camel picture, and it sounds like you’re having a blast in Syria. Hey Earl, You’re welcome. It is your heartfelt way of writing and enthusiasm for travel that keeps me coming back. You deserve all the interviews and mentions that you have had so far. I am quite sure there will be plenty more to come. Love the photo on the camel! Love the updates on where you have been. Most bloggers I follow travel through asia, that is cool but it has been most interesting to read about you going through Syria. It is you who keeps us coming back! Thanks for taking us along on your travels. Woo hoo! A pleasure to interview you and it’s great to se eyou getting the attention you desrve Earl.